PHP Scripts Mall experts have developed the new advanced Online Courses Learning Script with perfect user-friendly accessibility and online course learning systems with the user recommend functionality. We know that the online learning platform is more demand and have the greatest scope for developing the million dollar business in the pre-digital world. This Online Tutorial Classes Script will also make the tutors to share their knowledge experience by teaching the courses online with advanced digital learning methodology. The existing traditional learning systems are more complex, managing difficult and existing lately learning methodology in this digital world. To overcome this circumstance we have developed the future Online Class Tutoring Script. The Tutorials PHP Based Script is flexible and compactable which fits in all displays of the digital gadgets. We have made separate authenticate login portals for the users, students/learners and tutors to avoid the unauthorized person. The users can sign up with their valid credentials and they can log in to the system whenever they required. At the center of the homepage of our Online Tutoring Software they can find the advanced search bar filter to find the right class for the user by selecting the location, type of course and also entering teacher name or keyword in the search bar. In the middle page of the Online Courses Learning Script, they can find the popular listing courses with categories. The script is made with the unlimited categories where they also can add the recent courses, featured on and more. The learners can select the courses by seeing the tutor profile his/her experience, qualifications, rewards, feedbacks, career experience, specializations, locations, and other details. The tutor can also update their profile by modifying the account and also they can add the tutor profile with images, about me, bio details and other personal info. 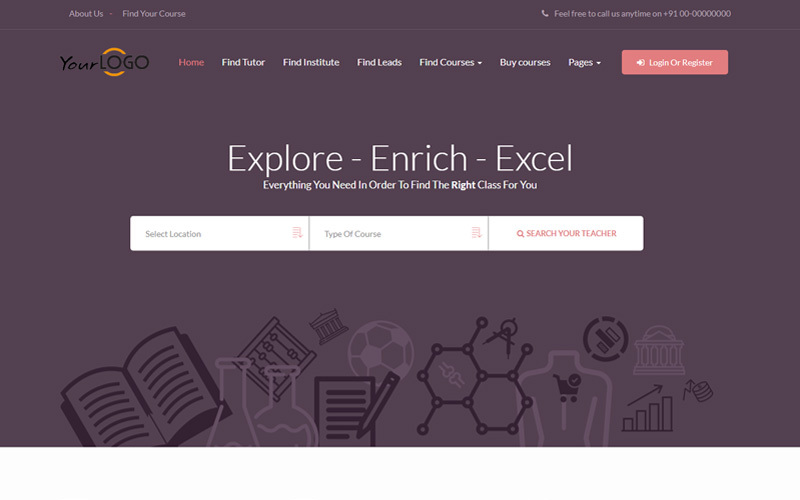 This helps the user or learners to select the tutor and course listing efficient and also made for the convenient. The Advanced Tutor Management Script has the site admin panel where all the managing details, listings are controlled by the admin. The admin can have separate login portals, this system will help the institute or entrepreneurs to start their own online video course learning site. This readymade script is customized developed with reliable and bug-free code. The online tutor platforms are excellent to share knowledge and also have financial benefits. The rise of this system will make the learners to learn from their place and also make the potential modes of the opportunity for the tutors.